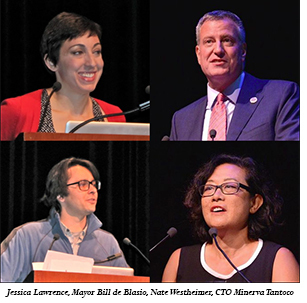 "His Mayorness" Announces City's First CTO - a Woman! Autumn in New York is a shining example of how great the city can be - sparkling with light and bursting with new ideas. The famous New York Tech Meetup, with over 40,000 members, personifies the city: big and friendly, inventive and hard-working, leading the technology community. It's the place to be. What other meetup has the Mayor show up? Bill de Blasio came up to the podium as a surprise guest speaker. Warm and enthusiastic, he fit right in. One of the presenters from HeatSeek, a helpful heat-sensing invention for the city, described de Blasio as "His Mayorness," which he thought was very cool. "First I want to thank Jessica Lawrence for her great leadership," said Bill. This is an extraordinary organization, an extraordinary gathering of people and she has done so much to help it grow, but also we have turned, in my administration, to Jessica quite a bit to help guide us in our efforts and to deepen our connection to the tech community...so let's thank Jessica for all she does. (Big applause.) So congratulations. 10th anniversary of the meetup. Pretty extraordinary. You should be proud of what you've done and what it means." To top it all off, in a night full of positive news, he announced New York City's first Chief Technology Officer, a smart and wonderful woman named Minerva Tantoco. "Our goal is to make New York City the most tech friendly and innovation driven city in the world," said Ms. Tantoco. Jessica Lawrence revealed an exciting new program of NY Tech Meetup called, "Women in Tech NYC." Its mission is to "increase the number of women participating in New York's technology industry by gathering, coordinating, and amplifying the work of organizations throughout NYC that provide opportunities for women and girls to be engaged and lead in the industry through education, networking, mentorship, and career development." Sounds like something Ms. Tantoco will love too. To find out more, go to womenintechnyc.com. 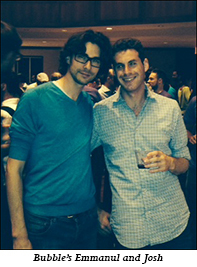 The NY Tech Meetup is always a delight. Ms. Lawrence and Nate Westheimer are brilliant leaders and the presenters each month are superb. Heatseeknyc.com - Empowering New York City to keep the heat on for those who need it most this winter. Presenters: William Jeffries, Jarryd Hammel, Harold Cooper. Tengrade.com - Cuts through the clutter of fake and irrelevant reviews to provide real opinions from your friends on any topic from pop-culture to pizza to politics. Knotable.com - A conversation platform that lets you get into the flow by focusing people together on topics that matter. Presenter: Amol Sarva. QuickMVP.com- Test your new business idea in just 5 minutes. Presenters: Grace Ng, Trevor Owens. Makrsplace.com - Enables anyone to design, produce - and now sell- cool stuff on-demand. Presenter: Danie Ortiz. Bubble.is - A new way of programming web and mobile apps without code. Presenters: Josh Haas, Emanuel Straschnov. Bitshift (Hack of the Month) - A semantic source code search engine. Presenters: Severyn Kozak, Benjamin Attal. TheCampusJob.com- An online marketplace that connects students with part-time jobs during school. Presenters: Liz Wessel, JJ Fliegelman. Dashlane (Alumni Demo) - The world's best password manager and digital wallet, making identity and payments simple and secure everywhere. Presenters: Zane Sterling, Josh Chin, Josh Hofing. Gethopscotch.com - Programming designed for everyone. Presenters: Jocellyn Leavitt, Liza Conrad. 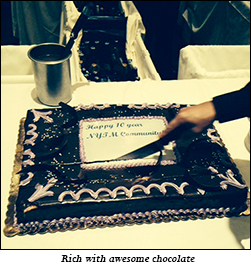 The After Party featured a huge, delicious anniversary cake and lots of mingling!